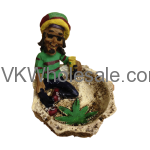 We carry good quality Jamaican Poly Resin Ashtrays in different design. Whether you have c-store, tobacco shop, smoke shop or any store, you can make great profit selling Jamaican Poly Resin Ashtrays. Individual can buy Jamaican Man Ashtrays for their personal needs and use them as decorative as well. Minimum quantity for "Jamaican Poly Resin Ashtray With Cover 1 PC" is 1. 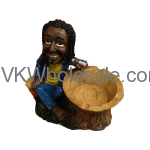 Minimum quantity for "Jamaican Poly Resin Ashtray - Blue Jamaican Man - 1 PC" is 2. Minimum quantity for "Jamaican Man Poly Resin AshtrayLT66 - 1 PC" is 2. Minimum quantity for "Jamaican Man Poly Resin Ashtray - Man on Leaf LT101- 1 PC" is 2. Minimum quantity for "Fantasy Poly Resin Leaf Ashtray 8 PCS" is 1.